Innaritu celebrates our humanity more powerfully than any contemporary Director. But his social, political and personal emotional landscape is implacable; often, true to the lives of many, starkly bleak. He puts in what is missing from most movies: the salutary reality that our aspiration to the good, our struggle for compassion and understanding of our fellow human beings is conditioned by the need to earn a living, to provide for oneself and one’s loved ones. His exploration of the possibilities of moral action digs deep as he unflinchingly shows us the reality we often deny: that morality is not a black and white choice between good and bad, right and wrong; but a constant dilemma of choice between the lesser of two evils, the conflict between personal and social moral imperatives. Nothing crystallizes these conflicts more acutely that the demands and duties of parenthood: it is much easier to love one’s neighbour as oneself than to give equal moral weight to the needs of our neighbour and those of our own children. Parenthood literally changes the ethical universe in which we struggle to be as good as we can. Set in a brooding, run down part of Barcelona tourists would do well to avoid, Uxbal (Bardem) struggles to be father, mother and breadwinner to Ana and Mateo. He has taken custody of the kids from his flakey bipolar wife Marambra (Mariel Alvarez) who loves the kids, hates herself and cannot take care of either for any length of time. In between doing the school run and helping with homework at each end of day, Uxbal’s time is spent crossing and re-crossing the ill-marked boundaries of the law. His business portfolio includes charging illegal, largely African, street sellers for their pitches by bribing the cops to turn a blind eye. With his brother Tito, he also has a ‘contract’ to provide illegal Chinese immigrants as work fodder for corrupt building companies. A deal with a local Chinese sweatshop owner provides squalid overnight shelter for these bewildered men, women and children. With palpable self disgust Uxbal also passes on supposed last words of affection from the recently deceased to their grieving relatives through a deal with the local undertaker. Uxbal is as much trapped in the corrupt and corrupting world of illegal immigration and racial and ethnic injustice as are the immigrants he both helps and exploits: without him they would not have a job; with him they are exploited, underpaid, exposed to danger at work and treated with contempt – but have somewhere to sleep and earn something each day to stay alive. This is a social class, an ad hoc community in a way, where acquiring the most basic necessities of life is a task handed on from one group to another like a grotesque game of pass-the-parcel: each gets a scrap of something almost worthless but the music never stops and no one gets the prize. A police raid captures Ekweme, one of Uxbal’s hawkers who is deported leaving his wife Ige behind nursing a baby. Like a modern day Job, Uxbal’s trials appear to be endless when he discovers that his neglected prostate symptoms have become terminal and he has about 2 months to live. Within this impossibly hostile environment we watch as Uxbal struggles to retain some sense of his own humanity: love and concern for his children; love for his wife but the necessity to fulfil her role with the children; affection and a modicum of protectiveness towards the immigrants he helps; and support for Ige when she is homeless with a new baby. When the immigrants suffer from the cold in their empty factory dormitory room Uxbal’s efforts to buy cheap heating for them misfires tragically and all are asphyxiated by fumes overnight. Distraught and with a keen sense of guilt, Uxbal’s confict of duty to try to prepare some form of security for Ana and Mateo after his death and deal personally with the tragedy he has unwittingly caused, is powerfully portrayed by Bardem’s quietly dignified underplaying. He uses his big-man gentleness and deep soulful eyes to convey a sense of a man whom reason says should have given up long ago but cannot because however imperfectly, he is driven by some sense of personal duty and honour, to do the best he can in impossible circumstances. 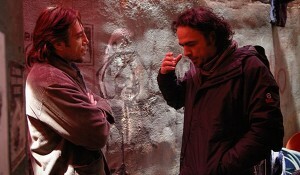 Biutiful is a difficult film to watch and painful to think about: but it draws you in by its quiet integrity of purpose. Technically it has a narrative structure that is both apposite and in the end when it becomes apparent, deeply satisfying. Innaritu dedicates this painful but in a sense ‘biutiful’ not beautiful film to his father: “his great oak”. The dedication is both fitting and uplifting. I only have a certain amount of emotional stamina for films with the moral complexity and clear eyed realism of Biutiful: but while this one demands much of the viewer, it is well worth the effort. The possibility of human warmth, dignity and our respect for one another in almost impossible circumstances shines through and makes one weep; not just for these characters in these situations; but for us all, oneself included.